You can use AFerry to book ferries to the Cyclades Islands including Andros, Tinos, Mykonos, Naxos, Paros, Santorini and more from Greece. Using AFerry will always get a great deal on your ferry to the Cyclades Islands. See below for timetables and the latest special offers. Booking a ferry to or from islands in the Cyclades couldn't be easier with AFerry. You can either use the booking form at the top left of the page. Or, if you see a price you like on this page, just select the number of passengers and click go. The Cyclades islands consist of 39 Islands of which 24 are inhabited. 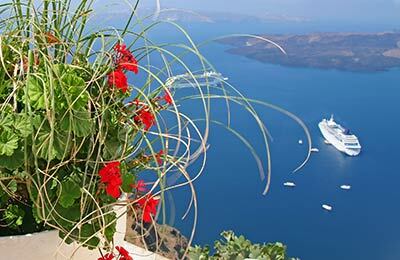 The Cyclades are the most popular of all the islands and attract thousands of visitors every year. The Cyclades are famous for their extraordinary weather, the beauty of the beaches and the charm of the architecture with ancient sites, droves of vineyards and olive trees, and stark whitewashed cubist houses. Whether you want to party, explore culture and history or simply soak up the rays and swim in crystal clear waters the islands within the Cyclades are the perfect destinations. If you book with AFerry and travel by ferry you can explore them all. 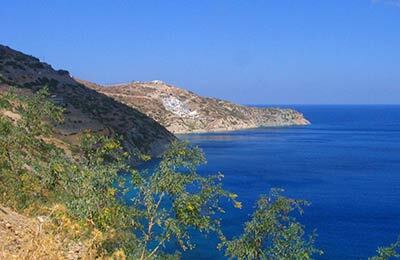 The Cyclades is, without doubt, one of the most famous island groups in the world. Islands like Mykonos and Santorini have reputations and a fame all of their own. Tourists from all over the world, from America to Brazil flock to these destinations with some people not even knowing they are part of Greece let alone a group of over 220 islands. White and blue are the colours of the Greek islands. When many people think of the Greek islands, one of their mental images is of Santorini. Countless films have been shot in here. The Bourne Identity, Tomb Raider, Sisterhood of the Travelling Pants are just a few of them. Santorini's unique architecture and breathtaking views will take your breath away and despite the summer crowds, the atmosphere is always relaxing. As you watch the sun go down in Franco's - the world's best bar according to Newsweek magazine - you'll feel as if you are a completely different world. Of course, the best thing to have at Franco's is a chilled glass of Santorini white wine - harvested on the island in unique vineyards where the vines never grow more than a few feet off the ground to protect themselves against the sea wind. Could there be a better feeling than watching the sun go down in Franco's with a glass of chilled white wine? I am sure not many people could say there is. Part of the magical feeling you have when visiting the island might be because Santorini is largely recognised as being the mythical island of Plato's Atlantis. According to Plato Atlantis comprised a vast technologically advanced empire spreading over numerous continents all of which disappeared in one single night of destruction and mayhem caused by a terrible earthquake. Take a trip to the pre-historic museum in the centre of town to discover just how advanced the Minoan civilization was on the island - thousands of years before the birth of Christ - and why there is such a good chance that Santorini was, and is, the lost Atlantis. You'll find stunning colourful paintings still in perfect condition and pictures of houses that very much resemble modern day architecture complete with windows, multiple storeys and basic plumbing. It is estimated that between 1600 and 1627 BC the volcano of Santorini erupted wiping out the Minoan civilization with the chaos that the earthquake and proceeding tsunamis bought. Of course Santorini is not the only island in the Cyclades. For the ultimate party island hop over to Mykonos by Ferry. Be prepared to see quite a few celebrities! You'll find some of the most famous clubs in the world and the world's biggest DJs. Be warned though that clubs like Cavo Paradiso - tourists destinations in their own right - don't open until midnight and only really come to life at around 5am. All in all, Mykonos provides the ultimate antidote to the tranquillity of Santorini. Another island definitely worth a visit is Naxos. If Santorini can be said to be island for partying then Naxos is the island for eating! If you want to sample Greek home cooked cuisine at its finest head over to Marw. It's not on the beach front but ask any local and they are sure to point you in the right direction. We guarantee you won't be disappointed with the prices, the portions and most importantly the taste. For traditional Greek seafood, including grilled anchovies and fresh calamari, go to Meze on the beach front. It won't be hard to miss because it's full day in and day out - even in the winter months. Don't be put off its packed to the rafters though - the waiting staff often use their ingenious skill to squeeze a table in where you might think one couldn't possibly fit. You'll find great cuisine at great prices and the service is quick and efficient. Of course, one thing that all the Cyclades islands have in common are magnificent sandy beaches and crystal clear waters. The waters are so clear, in fact, that fishing boats often appear to be floating on the air. However, be warned rushing into the sea is at full pelt is not advised. Unless swimming close to the still active Santorini volcano - where volcanic activity can make the sea feel like a warm bath - you will find the normal sea waters quite cold. However, as temperatures can reach the low 40s in August many people find a dip in the sea the perfect tonic. Without doubt, ferries are the number one mode of transport for getting from island to island. Be warned though, in the peak summer season you really need to book in advance to be certain of getting a place. Most of the islands have ferry ports right in the centre of town meaning you don't have to worry about getting a taxi or bus to your hotel or the nearest cafe for a relaxing frappe which is Greek ice-coffee - ask for a scoop of ice-cream in it for a really special treat. Busses are also available on all the main islands. A word of warning though, in the summer months they can get jam packed and it is best to allow plenty of time in order to get priority over the seats. If you want to be sure of getting a seat or sitting with your partner be prepared to do a bit of pushing and shoving. You'll also find Greek yiayias - grandmothers - push just as much as anyone else - sometimes with their walking sticks! 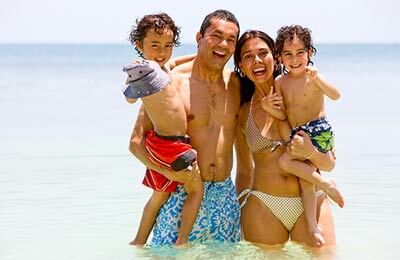 Of course, if you want to avoid the hassle of taking the bus a good alternative is car hire and in many islands you can also hire quad bikes to use on the roads. If hiring a quad bike, however, make sure it's one of the more powerful ones as you'll find yourself struggling with the strong winds. Go slowly and try not to become upset with other road users. Go slowly and try not to become upset with other road users. However, the payoff is definitely worth it. Having your own means of transport means you'll be able to explore places of the beaten track and not have to worry about the last bus back. You might often find you have the complete beach to yourself especially if you travel off peak. Even a few weeks after the end of August you'll find a dramatic decrease in tourist numbers. In conclusion, whether you want to party, explore culture and history or simply soak up the rays and dive into crystal clear waters the Cyclades are the perfect destination. If you travel by ferry you can explore them all.